Begin knitting the commissioned shawl. One of the yarns has already arrived and I can get started on the first part of it before the second skein arrives. Done. The second skein arrived last Monday, so there was no lag time or head start at all. I’m roughly halfway through it, maybe a little bit more – it’s hard to tell because I’m working on the longest section, which will end with around 400 live stitches. Bonus: it’s garter stitch, so while knitting, I finished the book I was reading (The Solitudes by John Crowley, 6th time reading it) and started another (The Chemical Wedding by Christian Rosencreutz by Johan Velentin Andraeae in a new version by John Crowley – lots of authors & a complicated explanation for that). Spin for Tour de Fleece every day. Done. I might even make it through this bump of Spunky Eclectic BFL and end up with a skein of yarn by the end of the Tour. Usually I spin much, much more and it’s hard to make myself spin and then, after I’ve gotten into it, rip myself away to work on the shawl. So it goes – I can always keep spinning long after the Tour has ended and the shawl is done. One of my favorite progress photos from TdF, which I’ve been posting daily on Instagram (I’m madgefaces there). I like this one because it shows both the roving and the singles really well. Go to TKD even though I don’t want to, even though it’s going to be hot and the dojang doesn’t have AC, go even if Julia doesn’t go. I went Monday at 6:30 without Julia and Saturday morning, where we had a lovely time faux-hitting each other in one step sparring practice. Drink at least 3 Nalgene bottles of water each day (32oz) so I can handle the heat and TKD. I didn’t keep track of this, but I also didn’t feel faint or ragingly thirsty at TKD or any other time for that matter, so I suppose my mission was accomplished. Carry on with the commissioned shawl. Spin for Tour de Fleece every day, even today, a rest day. Finish the pinks in the Fox Embroidery project. Almost! I have four more small things to embroider with pink. Check check check check, etc. I’ve surprised myself by getting a little into it too, so my spinning mojo is coming back. Go to TKD once or more. Get the house ready & grocery shop for the return of my family from S. Korea. I got the house ready but I didn’t grocery shop until today – I’d rather buy and make stuff that they want, not what I think they might want. In other news, I also got a commission for The Yarn Office (me) to make a shawl for an old college friend! I ordered the yarn and started planning for it. Hurray! And I decided what to make my friends Stephanie & Tommy for their baby: baby mitts and hats and (maybe) washcloths. I knit two wee pairs of mitts; I plan to knit a medium and larger size, too. I do need to brush up on my elastic skills; the 1×1 rib of the cuff isn’t elastic enough to keep them on a baby’s wrist. Baby mitts for Steph & Tommy’s baby. She knows I made them (she follows me on Twitter and Instagram) but I’m keeping the color a secret until after they receive them. I don’t want to overload myself; that commissioned piece is the most important thing on the list and I don’t want to get distracted or bogged down with other projects. I hope you all have a good week and that if you’re spinning for Tour de Fleece that you enjoy it as much I have been enjoying it, which is a lot! A good friend of is making my Pasithea Baby Blanket pattern as a gift for her nephew, who’s expecting his first child in August or September (I’m fuzzy on the details). She’s a fantastic writer and editor and found a few mistakes that my tech editor and I missed – I swear, no matter how many people carefully proof and edit, there are always a few niggling problems that escape into the wild. In this case, one was minor (two mislabeled subsections) and one was more serious (transposed instructions). As soon as my friend pointed these out to me, I updated the source file (InDesign) and created a new PDF for revision 3 of the pattern. I asked my friend to let me know when Ravelry notified her of the update – Ravelry notifies pattern buyers when a pattern is updated so they can download the updated version – and discovered there was a catch: she didn’t buy it on Ravelry, she was super sweet and gave The Yarn Office some traffic & a sale. The problem: etsy doesn’t have an easy way – or really, a way at all – to send an update or let purchasers know that one is available. I can go into the past orders for the shop and track down each buyer’s email address and, I suppose, email them an updated file. That’s fine for the moment since I have so few sales of that pattern, but what happens if/when I get more and it becomes more cumbersome and time consuming to send an update? I could add a note to my pattern template with my website, aka this blog, or Ravelry and start keeping track of corrections here/there. I could also just wash my hands of it and put a warning in the product description that the patterns won’t be updated, an option I really don’t like. Or I could just pull them all off of etsy and only offer them on Ravelry. And oh yeah, Craftsy. I need to noodle this through and really decide what my goal is with the etsy shop. I’ve put far more money into it than I’ve gotten out of it. Perhaps it’s time to put it on vacation mode for a while and revisit it when I have more clarity (and better things to sell). I’m in such a different place mentally; last year I was still recovering from something that happened in January and still struggling with drinking. I took my last drink in July, so I know I was craving it badly on my birthday – how else was I supposed to celebrate than to let loose? I’m happy to say I don’t feel that way this year. I can let loose any time, I just need to give myself permission to do so. I don’t need alcohol to relax, I can do that on my own in a number of ways, including fiber art stuff (knitting, spinning, even my nemesis, crochet). I was also still playing roller derby. I was on two travel teams and the captain on one. The pressure I put on myself to be a good captain was really bringing me down last year. I had a hard time focusing and being happy about the things I was doing well and only focused on the things I was doing badly, and that applies to my derby skills as well. I think I hit my peak skill level at the end of 2014 and 2015 was a slow descent into still okay but not as physically strong as I was in November & December of 2014. I stopped getting MVP Jammer awards (I have 9 or 10 from my 4 year derby career) and also stopped playing in as many jams, partly because my endurance was down after January and partly because my anxiety was shooting through the roof. I decided to quit the team I wasn’t captaining in May and take a step back after the season was over in June. What I didn’t realize is that I’d be done (for a while or for good, I haven’t decided yet). Last year I was also in the middle of my 100 day project. I designed and released two new patterns: Feathermoss and The Double Rainbow Scarf. I finished two hats, a sweater, two scarfs, three shawls, and did a lot of spinning. Luckily the project overlapped a bit with Tour de Fleece, so I got two birds with one stone. I also made felt and dyed it with false indigo; it’s the bright green felt I beaded & embroidered as the Moss Garden and this shmancy upcycled Sucrets box. And I felted one of my husband’s store bought wool sweaters (it no longer fit him) and embroidered on that with handspun naturally dyed singles (also what I used in the Moss Garden & the box). This year, I was on the lookout for the start of another 100 day challenge but it seems that there are a number of them; I might as well start a new one on my own any time. Rather than being so formal about it, I’ve just been trying to do something every day either with knitting, reviving my etsy shop, writing this blog, or keeping up with social media. I feel really good about reviving the etsy shop even though I haven’t had any recent sales. I’m positive I’ve paid etsy more than I’ve made off the shop, but my traffic and favorites are up thanks to working on my SEO so I still have some hope. I also feel good about designing – I will eventually move away from cowls to something else – and I’m looking into ways to expand my reach and become a little more professional about it. I found another designer group on Ravelry, one that actually has calls for submission. I’m working up the courage to respond to one of these and see where I can take this design thing. My family is doing well; my oldest will be graduating from high school in June and has decided where he’s going to college next year. My middle son has his learner’s permit & is doing really well with driving. He’s also running track this spring and breaking his previous PRs. And he thinks he just aced the AP Psychology exam. My youngest son has adjusted really well to middle school and I’ve been squeezing in all the hugs and kisses on the cheek that I can before it gets too weird/embarrassing for him. My husband is stressed in his job and travels every week and I wish he had time to look for a new one that’s local, but overall I suppose he’s doing okay – our marriage is more solid than it’s ever been. Lastly, pet-wise things are a lot different than they were last year. We had to euthanize our smallest dog, a toy fox terrier mix, last June. She badly ruptured a few disks in her back, lost control of her hind legs, and was in a lot of pain. Poor chick – she was a good dog, much more like a cat than our other two dogs. In November I started talking up cats to my husband (and myself – I wasn’t sure if I was ready for another pet) and in December we found the perfect cat for us thanks to some friends who foster cats for a rescue organization. Jeffrey Lebowski (aka The Dude) was just under a year old, is very calm/chilled out, and has fit in with our family so well – I post a lot of pictures of him to Instagram. All in all, I’m happy with where I am and what I’m doing! If you made it this far into my post, congratulations – I’d share my birthday cake with you if you were here, but you’re not, so go find some cake and have a happy Tuesday! Yesterday I tidied up part of The Yarn Office, my work/studio space (and the name of my etsy shop). 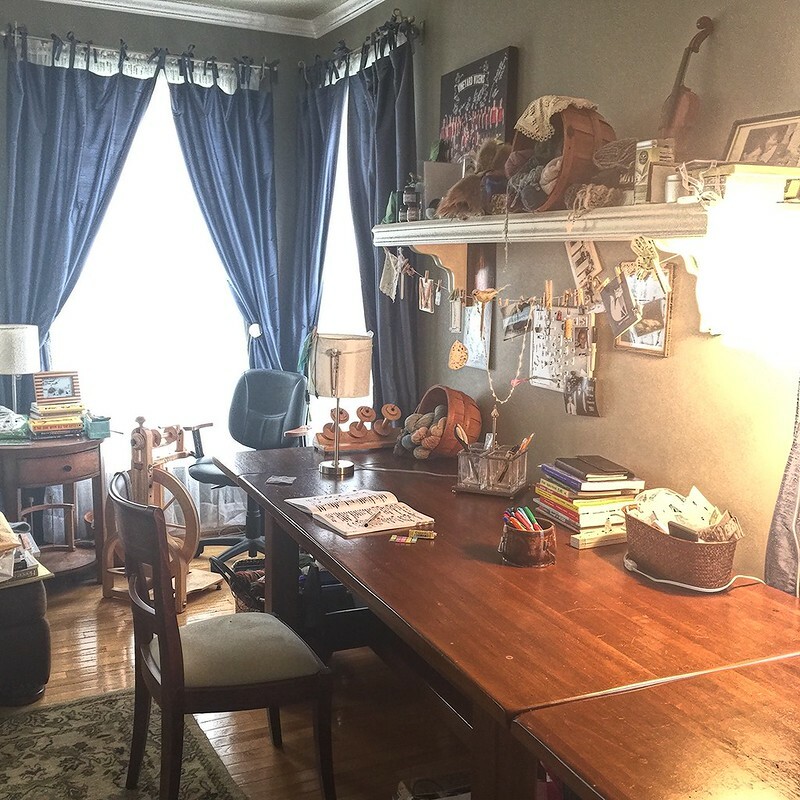 I used to occupy the room in our house known as the office but outgrew that several years ago and took over our formal living room. One of my sons called it “The Yarn Office,” which we all thought was very funny at the time, and the name stuck. I feel so much better having cleared my desk off and tidied most of the boxes and baskets that are hidden underneath it. I also cleaned off the top of my yarn stash cabinet, but not the inside – I still need to go through my stash (which has spilled over into a basket and box) and sort out the bottom shelf, which is where I shove yarn & project bags and where I keep things I don’t want to part with, like old journals and projects the kids have done. The bottom drawer also needs a good clean-out; it’s where I keep my knitting needles, beading supplies, extra whorls for my spinning wheel, and other miscellaneous things. 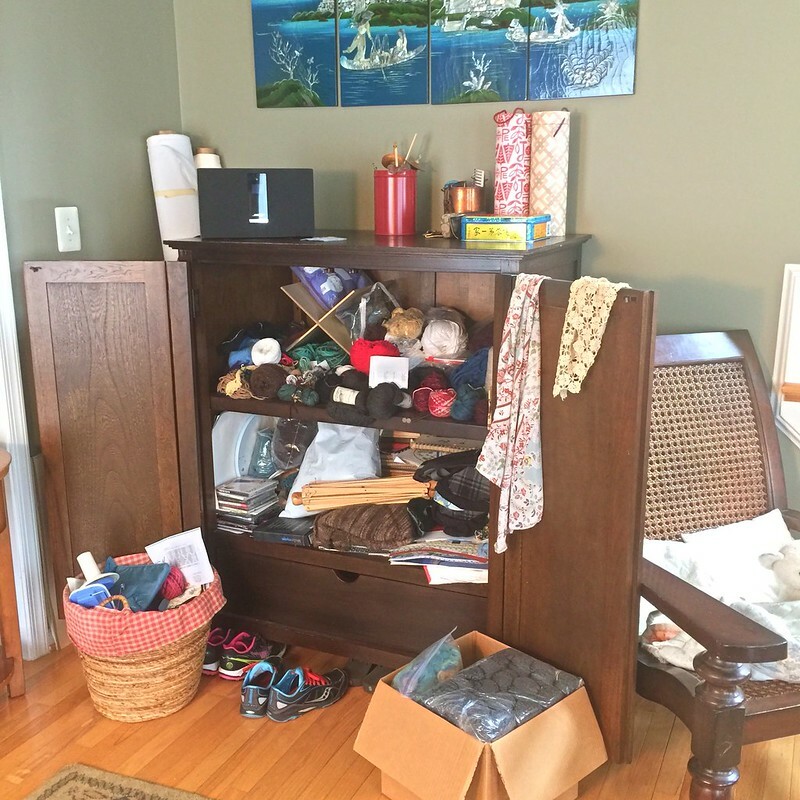 See those rolls of fabric in the corner in the yarn stash picture? I need to do something with them, like sell them or give them away. I’ve had one of them for 5 years and the other for 2. I was going to make curtains, but I don’t get along well with my sewing machine (ironic because I come from a long line of seamstresses). If I haven’t done anything with that fabric yet, I don’t think I’m going to. That pretty much applies to the rest of my fabric stash – I need to use it or lose it. This spring has been all about being realistic about what I can and want to do and letting go of things & projects that I’m not going to tackle any time soon. I haven’t even touched on my fiber stash, which is taking up a little room under my desk and an entire corner of my dining room. I’m hoping to take my unwashed fleece & washed but not carded fleece to Maryland Sheep & Wool next weekend to drop off at the Singleton Fiber Processing booth. They’re within driving distance; I just haven’t gotten around to getting my fleece there since I decided 2 years ago that I’m not interested in processing them myself. I’m glad I know how to go from sheep to yarn but I’d rather work with finished roving for now, which I haven’t been doing because I have fleece guilt. Ah, the life of a procrastinator is filled with guilt, but I’m working on both of those problems. How about you? Have you done any spring cleaning?